Changes in Red cell distribution width (RDW) precede MCV changes in anemias due to B-12, folate, and iron deficiencies. Thrombocytopenia is associated with skin/mucosal bleeding (petechiae, gingival bleeding, epistaxis, heavy menses), also hematuria, and GI bleeding. Coagulopathies more commonly present with intracranial bleeding, retroperitoneal bleeding, and hemarthrosis. Girzadas comment: I have also seen GI bleeding and deep tissue hematomas with coagulopathies. The clinical finding most commonly associated with ITP is petechiae. It makes sense because petechiae is in the name of the the disease “ Idiopahtic thrombocytopenic Purpura”. Acute ITP is more common in kids. Chronic ITP is more common in adults. 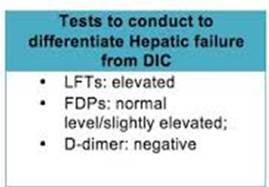 *Liver dysfunction vs DIC Liver dysfunction will have not much elevation of fibrin degredation products and a negative D-Dimer. There was a discussion of performing paracentesis in patients with low platelet counts and/or coagulopathy. Harwood comment: unless the patient is bleeding you don’t need to correct the platelet count or the INR. Harwood added that every doctor will have a minimal platelet count threshold below which they would be unwilling to do a paracentesis. His cut off was 50,000. Elise added that because we use ultrasound to guide paracentesis, there is less risk of puncturing a vessel. We then discussed doing LP in the setting of low platelets and coagulopathy. There was consensus that LP could be done if platelets were above 50,000. No one would do an LP if the INR was prolonged. In conclusion, severe haemorrhage after abdominal paracentesis is a rare (0.19%) but potentially lethal complication. We report death following this complication in 0.02% of all paracenteses performed. Most haemorrhages occurred in severely ill patients and were rarely seen in patients with severe thrombocytopenia and/ore elevated INR. All but one occurred in the context of some degree of renal failure. The management of this complication can be conservative. Short-term prognosis is nonetheless poor and seems related to the underlying liver disease. Utility of the systematic prophylactic administration of agents that improve platelet function in patients with renal failure requiring abdominal paracentesis could be assessed prospectively. Unfortunately, this would be difficult to realize because of the very large patient sample required. Conclusions In our study of children undergoing remission induction or consolidation therapy for acute lymphoblastic leukemia, serious complications of LP were not observed, regardless of platelet count. Prophylactic platelet transfusion is not necessary in children with platelet counts higher than 10 × 109/L. Due to the small number of patients in our study with platelet counts of 10 × 109/L or less, conclusions cannot yet be drawn for such patients. Acute chest syndrome is the leading cause of death in sickle cell disease and most common cause of admission as well. There was discussion and a search of references on this point There is controversy whether the most common cause of death is due to acute chest syndrome or infection. There was agreement that there was overlap between the two etiologies. Hydroxyurea has been shown to reduce the frequency and severity of painful crises in children but has not been FDA approved. Hypercalcemia treatment includes normal saline, calcitonin, zoledronic acid. *Electrolyte abnormalities on EKG QT lengthens with hypocalcemia and shortens with hypercalcemia. T wave varies based on potassium level. We all worked through the new protocol for the management of ICU Boarders in the ED. In situ simulation of the new protocol will occur 1-13-2015. We have been successful in getting patients to CT rapidly. We discussed various strategies to shorten the time from completed CT to administering TPA. *Strategies for speeding the delivery of TPA Dr. Campanella discussed many of these strategies. He had some discomfort of giving TPA in the CT scanner. He felt that it was more reasonable to use the time of transfer back to the ED to make sure the history and time of onset was as verified as possible and that the CT images were carefully reviewed. Those with both history of stroke and diabetes. This study has only been presented in abstract form. The manuscript should be out in 2-2015. Neurologists like it because it backs endovascular therapy for stroke. There are however some methodological criticisms of the study. Parents bring a young child to ED for possible intranasal FB. Patient has dried brown nasal drainage in nose but with speculum exam, no foreign body was identified. Full visualization of the nasal passage was difficult due to swelling of the inferior turbinate. Patient was discharged with ENT referral for the next day. Child followed up with ENT the next day. ENT identified a button battery in the nose and by that time the patient had suffered a severe burn to his nasal passage. He required a nasal stent. Aspiration of a nasal foreign body is possible but a review of case reports demonstrates that most of the time aspiration occurs with attempted removal of the foreign body. Only rarely does foreign body aspiration occur spontaneously from a nasal lodging point. Button batteries are corrosive to tissue. In addition, they cause necrosis by both electrical discharge and pressure on the tissue. Button batteries are ubiquitous. Kids can get them from multiple toys/gadgets in the home. Musical greeting cards are a big problem because kids can get at the button battery inside quite easily. Case reports show that perforation and extensive burn from a button battery in the nose can occur within 90 minutes. Based on this case, it was suggested to ask parents about the possibility of button battery insertion. Also consider xray imaging of head to identify metallic foreign body in the nasal passage. Consult ENT while the patient is in the ED if there is any concern for a button battery in the nose. Andrea, Elise, and Andrej made the comment that this was a very unusual case, “worst case scenario”. Based on this case, they all felt that if you have a suspicion for nasal foreign body and you can’t visualize the nasal passage well, get an xray to rule out battery insertion in the nose. Any non-battery nasal foreign body can wait until they see the ENT specialist to have it removed if you can’t get it out in the ED. Harwood comment: What I learned is that if the child has pain in his nose or drainage within a few hours after suspected foreign body insertion I have to strongly consider battery foreign body in the nostril and get an xray. * Xray image of button battery in the nose. You have to get this out ASAP. Call the ENT specialist even in the middle of the night. A= Approach. Patients present with confusion, lethargy, or bleeding. DDX is broad including encephalopathy, cerebral edema, intracranial hemorrhage, elevated ammonia level, GI bleeding. Patients can also present with fever. You have to consider all potential sources of infection. Keep spontaneous bacterial peritonitis at the top of your list, Patients can also complain of edema and ascites. Patients can have electrolyte abnormalities and coagulopathy. There was a discussion of the best way to manage the airway in the cirrhotic patient. General consensus was to do RSI with the patient in head up or RAMP position. Head up position can take some pressure of the diaphragm and improve oxygenation/ventilation. Use rocuronium instead of succinylcholine. Succinylcholine can cause hepatic failure in the cirrhotic. Ketamine can also cause hepatic failure in the cirrhotic. Most faculty however, didn’t feel there was a huge risk to using ketamine in these patients. B= Bacterial infections Cirrhotic patients are immunocompromised. Spontaneous bacterial peritonitis carries a high mortality. Diagnose SBP early by performing paracentesis in the ED. Paracentesis is indicated for patients with fever/pain, prior history of SBP, ascites and/or GI bleeding and/or encephalopathy. There was faculty pushback on tapping the bellies of patients with just ascites and encephalopathy or ascites and GI bleed. Faculty all felt patient had to have some sign pointing to peritonitis beyond ascites like fever, pain, tenderness, or leukocytosis before they would perform paracentesis. Who should undergo paracentesis in diagnosing/treating SBP in the ED? C= Coagulopathy. Transfuse in platelets are less than 10. INR is the most sensitive sign of worsening liver function. If INR is prolonged and patient is bleeding give vitamin K and FFP. C= Circulation. Cirrhotic patients can be hypotensive. They are prone to bleeding, volume depletion, infection, and third spacing. Crystalloid replacement is appropriate. Colloids are indicated only for large volume paracentesis and hepato-renal syndrome. D= Drug considerations. Opioids can have prolonged sedation. Fentanyl is preferred due to its short half life. NSAID’s have risk of increased renal toxicity. Benzodiazepines can have prolonged sedation. Zofran should be used in smaller doses. No more than 8mg in 24 hours. It can cause hepatotoxicity. Treat seizures with lorazepam and keppra. Dilantin can cause hepatic failure. E= Encephalopathy. Always get a head CT to evaluate for cerebral edema and intracranial hemorrhage. Treat with lactulose. Lactulose traps ammonia and carries it out in the stool. Our ED is a study site for the ATACH-2 trial, Antihypertensive Treatment of Acute Cerebral Hemorrhage. The study goal is to identify if there is benefit to lowering the BP to less than 140 or less than 180 in patients with acute cerebral hemorrhage. BP is controlled to these levels for 24 hours. Patients will be assessed at 30 days for neurologic outcome by blinded neurologists. Patients are treated with IV nicardipine within 4.5 hours of symptom onset. There is an iphone/android app for your phone to help you enroll patients in the study. The app is called ATACH-2. It has all the enrollment criteria and has a easy to use NIH Stroke Scale.